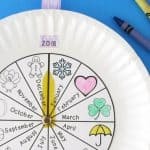 This Easter egg alphabet activity is a fun story extension for a cute book. You can set it up as an invitation to play or as a more directed activity. 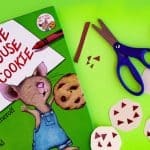 Disclosure: Books and Giggles is a participant in the Amazon Services LLC Associates Program, an affiliate advertising program designed to provide a means for sites to earn advertising fees by advertising and linking to Amazon.com. Peep and Egg: I’m Not Hatching (affiliate) is an adorable book for Easter and springtime reading. It’s also this week’s Virtual Book Club for Kids selection. This Peep and Egg story features a conversation between two chicks, one of whom has yet to hatch. The yet-to-hatch chick is afraid to come out, and repeats the refrain “I’m not hatching” throughout the story. Its chick friend tells it about all the fun they could have together. Finally, it does hatch, not wanting to miss out on anything. For an alphabet activity based on the book, we focused on egg hatching. Children open plastic eggs, and find cards with chicks holding up letters. 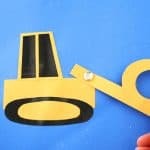 It’s a simple way to work on letter recognition and letter sounds. The plan for this activity started when I saw silly plastic bunny tongs at Dollar Tree. They’re meant for dying Easter eggs, but they also make a fun toy! You could also use regular tongs, though. 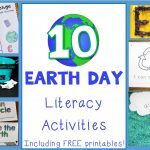 The idea is to make the activity extra engaging and provide some fine motor work along with letter learning. To get ready, gather up some plastic eggs and to raid your kitchen for a plastic egg tray like the one pictured above. Alternatively, you could just lay eggs out in a basket on some of that fake Easter grass. Finally, you’ll need a printout of the little cards I made for you. There is a color version and a black and white version of all 26 letters. Grab your printable by clicking here: Chicks Hatching. Cut apart the chick printable and set aside the letters you want to work on. I suggest you only work on a few new ones at a time. Put a card inside each egg. 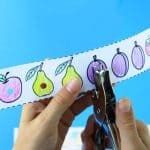 Then, have the child use the tongs to pick up an egg, open it, and name the letter and/or letter sound on the card. For a more directed activity, talk with your child and help make sure she’s naming each letter. If you prefer more of an invitation-to-play approach, just read the story and introduce the materials. Print out an extra copy of the chick printable, and have your child match the cards from the eggs to the second set of cards. 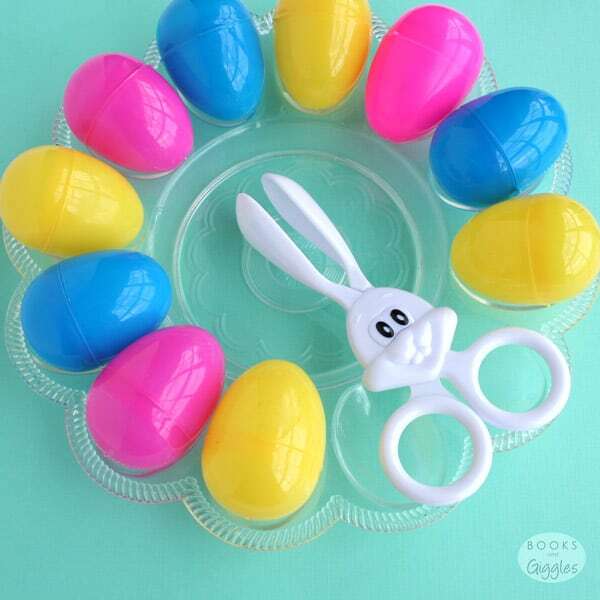 Write letters in permanent marker on the outside of the plastic eggs. The child names the letter sound, and then opens the egg and checks against the phonic picture. Put all the eggs in a basket, and have the child pick up each egg with tongs and transfer it to the tray. Once all eggs are transferred, then she can open each egg to read the cards. 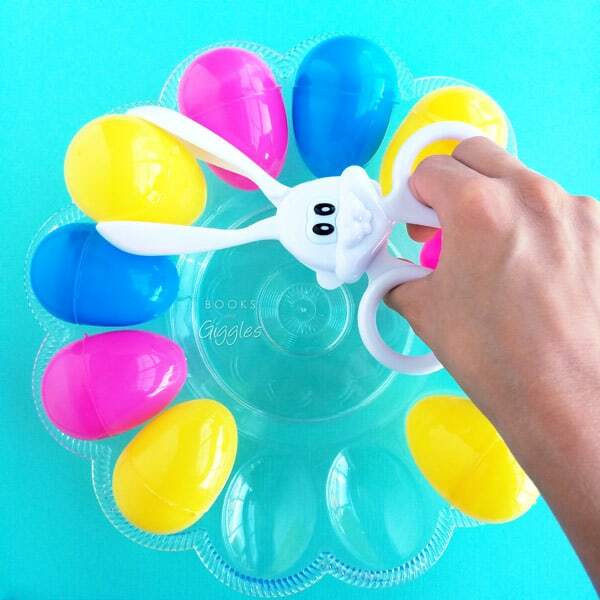 Work in reverse: have the child fill the eggs with the cards, then transfer the eggs from the tray to a basket. Then open the eggs from there.